Play is a right of every child, along with leisure and recreational activities. A growing body of research suggests that play has both immediate and long-term benefits to children’s health and wellbeing. Children should be able to experience play to the fullest in school environments. Outdoor Play and Learning (OPAL) is a play provision training program that is designed to protect a child’s right to play, particularly at elementary schools. OPAL transforms attitudes to play provision, supervision and risk management. It encourages schools to use “loose parts” to enrich and diversify the play offering. Since the spring of 2016, Earth Day Canada (EDC) has been working closely with 6 school communities in the Toronto District School Board (TDSB) to adapt OPAL to Ontario. A longitudinal evaluation of the OPAL pilot was designed using a mixed methods approach. (2) provide insights that would improve larger scale program delivery at other Canadian school communities. The study team collected baseline data in spring 2016 from 352 children in grades 4, 5 and 6. Follow-up surveys and key-informant interviews at some schools were conducted in 2017. Baseline data indicated that while most children were happy when playing outside, nearly 18% children were not happy with their outdoor play experiences at schools. Between 6% and 12% of children did not play outdoors during recess or lunch periods. The study identified generally high levels of parental support for outdoor play at the pilot schools, but children identified school play conditions (including the quality of play supervision, play equipment and play environment) to be moderate at best. This is an important topic that needs further attention, as we identified a statistical relationship between conditions for play and a child’s overall subjective wellbeing. Interviews with OPAL champions at schools indicated that outdoor play has become more engaging, inclusive, and imaginative after the OPAL programming. OPAL playgrounds have also created opportunities for children to be more physically active during the recess periods. Especially at the kindergarten level, teachers have noticed improved opportunities to develop motor skills during recess periods, and improved focus and classroom behaviour. At the time of writing this report, Chester Elementary School is the only one among the 6 pilot schools where children in grades 4 to 6 have had sufficient regular, consistent exposure to improved play conditions. Our follow-up surveys revealed that more children at Chester Elementary School are playing outdoors during lunch, and for a longer period of time. More children are happier when playing outdoors, and more children self-reported higher overall subjective wellbeing. The key informants also discussed several challenges to the implementation and long-term sustainability of OPAL programming in Toronto. Ensuring adequate training to lunch supervisors and caregivers, theft and vandalism of play equipment, and replenishment of loose materials on a regular basis were identified as top concerns. As the 5 other pilot schools intend to move towards whole school rollout of OPAL in the following year, we wish to go back to these schools to collect further follow-up data, in order to identify both short- and long-term benefits of OPAL. 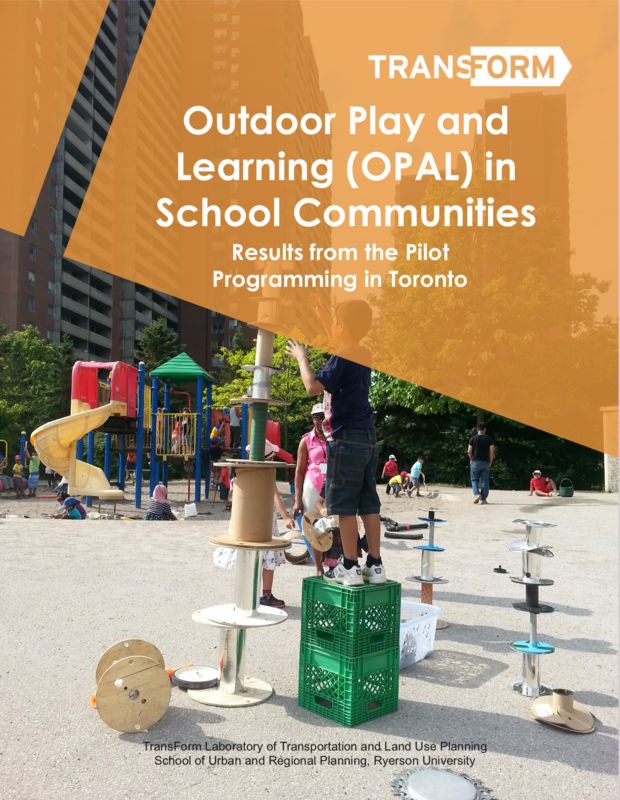 Our research findings provide valuable knowledge that will inform and encourage larger-scale play programming interventions across Ontario and Canada.